Generic Medicine Price List 2018 Recently in Allahabad SRN Hospital has open new Generic medicine Davakhana to sell drugs on affordable rates to mankind. 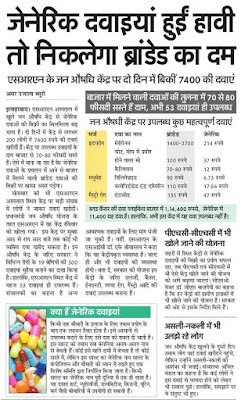 Within 2 days 200 people buys 7,400 rupees of generic medicine in Allahabad Hospital. 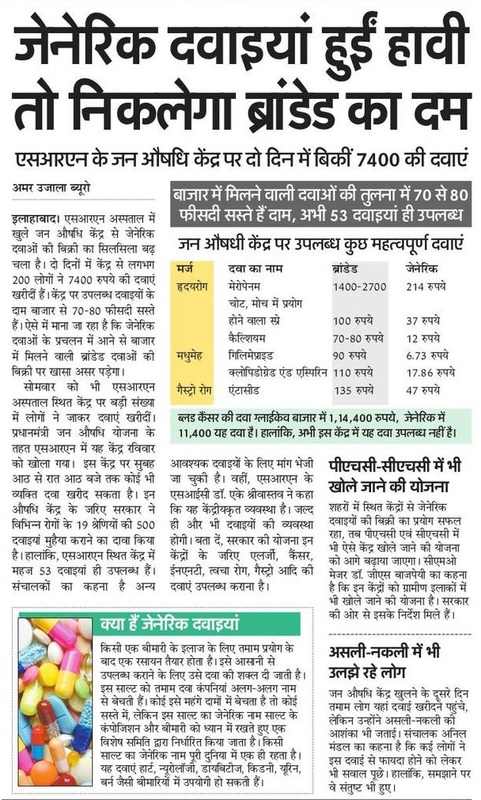 The available drugs in central govt hospital are 70 to 80% percent cheaper than in market. On Monday also 100 of people were eager to buy generic drugs. Due to eagerness of public interest Jan Aushadhi center outlets on Sunday will also open. 2. In this Aushadhi Kendra you can visit Morning 8 AM to evening 8 PM and anybody can purchase. 3. Through Jan Aushadhi Kendra Government claims we have given 500 Different types of Generic Drugs. Generic Medicine Latest News 2018:- Government has also said soon we give Allergy, Cancer, ENT, Skin Disease, Gastro type etc medicine also. PHC CHC Generic Medicine Store: - If the sale of Generic medicine in Jan Aushadhi produce good amount of profit than government has made plan to open Jan Aushadhi Center on PHC, CHC. Talking to chief Medical officer he said,'' we are making list of opening Jan Aushadhi Generic shop in village, town and govt has issue directive on this. Generic Medicine Vs Branded Medicine: - Many People still confuse in buying while comparing to original Generic medicine and Fake Medicine but through receipt of Jan Aushadhi Kendra some candidates feels relaxed.